Need a lemur fix but going to Madagascar doesn't fit into your budget? Spend time with the 250 or so prosimians living at the Duke Lemur Center in Durham instead. 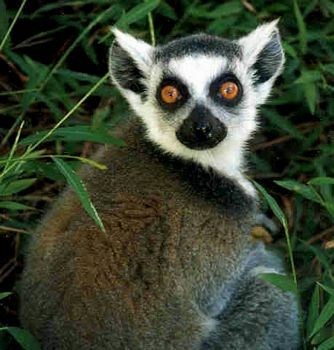 Lemurs are the ancient relatives of monkeys, apes, and humans, having evolved earlier than the rest of us. Fans of PBS Children's programming may remember a show about a curious little lemur named Zoboomafoo. The lemur that portrayed Zoboomafoo was actually Jovian, a captive Coquerel's Sifaka that resided at the Duke Lemur Center in Durham, which was one of the locations where the PBS program was filmed at during its run. Jovian enjoyed his retirement from showbiz at the Lemur center and was a visitor favorite until his passing in 2014. Since 1968, the Duke Lemur Center has worked to study, understand, protect and preserve these endangered primates. Sadly, one-third of the lemur species is now extinct. The center in Durham sits on 85 acres in the Duke Forest and is home to approximately 250 animals that include 233 lemurs encompassing 15 species. There are also lorises from India and Southeast Asia, and bush babies from Africa.The animals are housed in a variety of social situations, some are caged at the Lemur Center, and others live free range in a large area on the center’s Duke Forest property. It is the world's largest captive collection of prosimians. Their caretakers work diligently to ensure the good health and all other aspects of well-being of the animals under their care. The Duke Lemur Center is involved with the community to promote awareness through outreach programs, education and special interest projects. Their web site is loaded with information and has a blog with entries about lemurs named Dan Akroyd, Jodie Foster, and Lawrence Olivier, plus the latest info on Lemur Art (they finger paint), how lemurs stay cool in our warm southern climate, and many other tidbits about lemur life. The Lemur Center is open to the public by appointment only. Visitors can not just pop in to see the animals. Guided tours are led by knowledgeable staff members or docents on Monday – Saturday. It's best if you call two weeks before the date you want to be there as the tours fill quickly, especially in the spring and summer. Special extended tours and tours for school groups are also available. No appointment is needed if you would like to visit the gift shop, which is open during the regular Center hours: Mon. – Fri. 9 – 4:30 and Sat. 10 – noon.